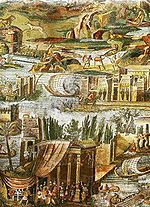 Nile Mosaic of Palestrina. Circa 100 BCE. Portion of Nile Mosaic of Palestrina. Circa 100 BCE. This image (or other media file) is in the public domain because its copyright has expired. This applies to the United States, Canada, the European Union and those countries with a copyright term of life of the author plus 70 years. This page was last modified on 13 October 2007, at 10:30.